There are some music genres that you have to be in the right mental and psychological state in order to listen to them. Well, right now, after a three day 80's Metal festival, I'm not in the mood for Doom, even though I like this kind of Metal in general. But when you have to do a job, you have to do it as good as you can. To tell you the truth, I didn't know SYRACH; I only came across their name once or twice in the past and that's about it, despite the fact that they were formed in 1993. These Norwegians released two demos before their debut album Silent Seas released in 1996. 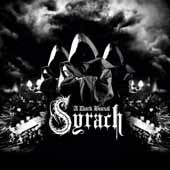 Until 2007, when their second album was released, SYRACH was touring and made several lineup changes. This album, Days Of Warth, drew the attention of Napalm Records. So, after a long tour all over Europe, they went to the studio to record their third album, A Dark Burial that is in question here. The last thing I should mention is that, their guitar player Noralf Reichborn Venaas left the band for personal reasons just after the recordings were over. Just by reading the song-names, I wasn't that thrilled to listen to this album. They couldn't be more typical for that kind of Metal and that's something I don't like, most of the times. The production is good, with everything having the right dynamics and you can tell apart every instrument. The music itself reminded me of early MY DYING BRIDE, PARADISE LOST and ANATHEMA but not in that depressing way. Well, it's not something that you never heard before, but at least it is well played. In Doom Metal is natural to have long in time duration songs but the problem here is that the long ones like A Mourners Kiss and the self titled, lack of inspiration in some parts, making the song boring or, at the best scenario, just something playing in the background when you are doing something else. On the other hand, some riffs in the same tracks, could easily belong to other genres of Metal, which is nice since those ideas wakes you up and there are really interesting. As for Kenneth Ripper Olsen voice, it has something from the pre-mentioned bands on their old days since he has no clean vocals in this album.